Google has expanded its Knowledge Graph and added relevant explanations connected to the subject of your search. 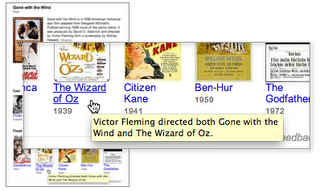 Now, search for the movie "Oz the great and powerful" will reveal suitable explanations about the movie like "L. Frank Baum wrote the story for both The Wizard of Oz and Oz: The Great and Powerful" and for the movie Gone with the wind will return "Victor Fleming directed both The Wizard of Oz and Gone with the Wind". These short but useful snippets would help to increase the knowledge of the users and add a reliable feature to the ever expanding Knowledge Graph. The main purpose is to find out the relationship between people and how are they connected with each other. Don't know Scuba Diving? Don't worry! Dive Underwater with Google Maps!